This is a Nurture Your Business segment with Dana. Dana gives applicable advice for dealing with those times you’re stuck in learning mode, and why you might be there. This show is sponsored by T. Bosler Writing. What constant learning mode is. Implementing things into practice is scary. Learning mode can be really great! The opportunity cost to being in learning mode. What we need to use learning mode for. How to get out of learning mode. Some ground rules for staying focused. Having a budget to get courses and support that helps you and your business. 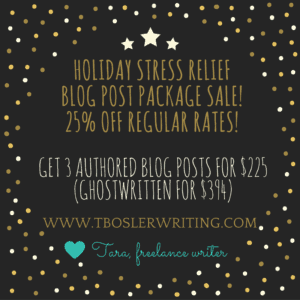 Tara is offering a Holiday Stress Relief Writing Package: 25% off all her current rates! That means $225 for three authored blog posts, $394 for three ghostwritten blog posts, and 25% all her web copy rates as well. Visit her website, T Bosler Writing, for more information on her services! Mention Boss Mom for your 25% off holiday stress relief package!